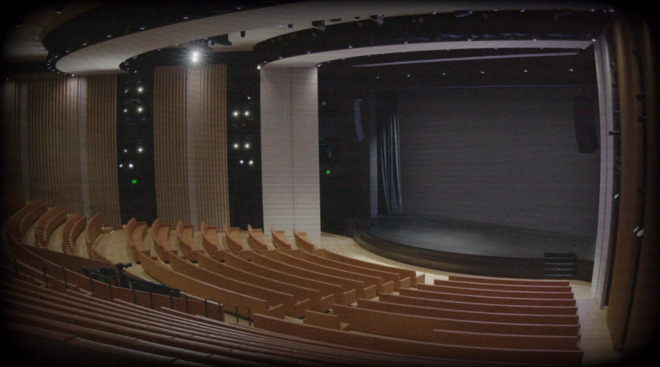 Drumming up publicity for Monday's press event, which starts at 10 a.m. Pacific, Apple is already running a purported "livestream" from the Steve Jobs Theater at Apple Park, usually showing little more than a empty stage. The stream nevertheless cuts between angles occasionally, also capturing empty seats. It's not clear whether it's genuinely live or staged, but Apple normally saves its bandwidth until minutes before an event begins, and some of the onscreen graphics don't appear to blend properly. As of this writing the feed has been ongoing for hours. In that time only a few incidents have disturbed the stream's emptiness, such as a phone call from actor Chris Evans. Evans is playing the role of Andy Barber in "Defending Jacob," one of the many TV shows Apple may preview tomorrow as it announces an on-demand video service. That service should mix original material with subscriptions to outside services like Starz, Showtime, and HBO, possibly at a cost of $9.99 per month each. The event should likewise see the debut of an Apple News subscription service, offering access to various magazines and newspapers at a cost of $9.99 per month. To the disappointment of many it's thought that the Washington Post and New York Times won't be onboard, rejecting a rumored 50/50 revenue split. AppleInsider will be live from Monday's event with updates as they happen.